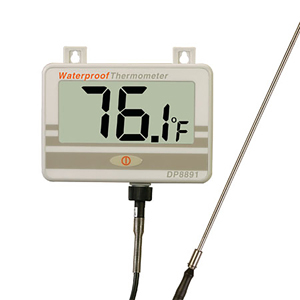 Monitor temperature applications with the DP8891 Series. The DP8891 Series offers a wide temperature range, and can be used both as a portable unit, or a wall mounted large LCD meter. The meter and probe (when connected together) offer waterproof (IP67) rating. Easy to use and ºC/ºF switchable. Comes complete with probe, probe holder, 4 “AAA” alkaline batteries and wall mount hardware. Replacement probe can be purchased separately. Nota: Comes complete with precision thermistor probe, probe holder, 4 “AAA” alkaline batteries, wall mount hardware and operator’s manual.